Wise decision. My memories are haunted with the ghosts of too many former cohorts who did not have parents able to guide them to a different fate. In my waking life, I also cross paths with those who barely survived, are now out of jail, and stumble like zombies through Astoria in a haze of methadone and regret. In the name of further altering my wayward path, my parents also chose to send 14-year-old me to a Catholic high school -- Father, Son, Holy Ghost -- instead of the local public school where the rest of my crew was going. Questionable move. Sure, attending the Catholic high school required me to take a short subway ride away from my troublesome “turf,” but it turned out that the institution was commonly known as “pill hill” -- thanks to the rampant and legendary student (and sometimes faculty) drug use. Perhaps the land was under the influence of apparitions thanks to its previous use? Amidst the tales and urban legends of hallway hauntings and unexplained occurrences in my new setting, I once again gravitated towards the sinners. It would be decades before I could finally outrun those demons. I recall during freshman year, my Mom surprised me outside school as I left one day. For most kids, this might have been mortifying. But I was secure in my coolness and I adored my Mom… so it wasn’t a major social faux pas. As Mom and I walked together to the bus stop, we passed a group of older students -- hanging out, drinking, and smoking weed. One of these students was Eddie W. Technically a freshman after being left back twice, Eddie was two years older than me yet was a pal of mine from Spanish class. The Ws sit near the Zs in the realm of alphabetized seating. Side trip: Seated between W and Z was Albert Y. Being blessed with a photographic memory guaranteed me an A in freshman Spanish so, during those infamous pop quizzes Mr. Antinore would drop on us, I’d lean forward to write the answer and whisper it Albert who’d lean forward to write the answer and whisper it to Eddie. Sure, the Spanish word would sometimes get lost in translation and it’s not like Eddie ever really cared, but he knew I could be counted on. This ingratiated me with him and thus, with his badass crew of older dudes. As for Albert, he was a simple guy but when I found out his uncle was in charge of security at Madison Square Garden, me and Albert became buddies. I’d see Rangers and Knicks games for free and one summer, he got me in to sit up close for a Stones concert! I happily waved back to Eddie and the others. Little did I know that within about three months, a very wasted Eddie W. would meet his fate by drowning in the riptide at Rockaway Beach. “Dead or in jail” are often the options, remember? She was not pleased… and neither were my teachers. Throughout high school, the faculty haunted me with the word “potential” -- and how I was wasting it. In particular, there was my favorite English teacher: Mrs. Flood. I took a class called “Short Story” with her (in a premonition of future paid work, I ghost-wrote short stories for about a half-dozen friends to hand in, btw). She loved my writing and sometimes shared my creations with other teachers. Many years later, however, I went back to my high school on Career Day to talk with students about being a writer. I sought out Mrs. Flood to hug her and to give her a copy of one of my books -- in which I thanked her for always believing in me. Not all returns to pill hill are hauntings. The aforementioned Mr. Antinore was my Spanish teacher for two years and my driver’s ed instructor, too. During Senior year, the school posted a list of students who made something called the “National Honor Society.” Yours truly made the list, despite never bringing home a single book over four years of lessons. Yeah, I was silent after that. Bluntly reminded that I had a whole lot to learn. Feeling more than a little awed, I shook his hand. Mr. A sincerely wished me luck. “Keep writing,” he urged. For better or for worse, long after escaping the clutches of pill hill, I have kept writing. And this one’s for Mrs. Flood, Mr. Antinore, and the spirit of Eddie W. -- wherever they may be. 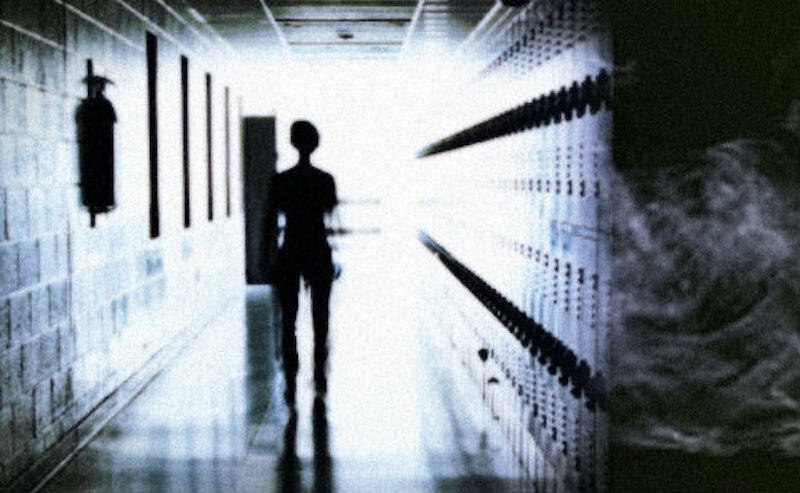 The ghosts of high school lessons past by Mickey Z. is licensed under a Creative Commons Attribution-ShareAlike 4.0 International License. Based on a work at https://worldnewstrust.com/the-ghosts-of-high-school-lessons-past-mickey-z.